Medical cannabis patients, campaigners, and experts plus two MPs went to 10 Downing street to demand urgent action on Medical Cannabis. Later they met with other MP's, plus Lords and supporters at a packed meeting in the Houses of Parliament. Above: Medical cannabis campaigners including Labour MP's Paul Flynn and Brian Iddon (Chairman of the 'All Party Parliamentary Drugs Misuse Group') take the issue to 10 Downing Street. 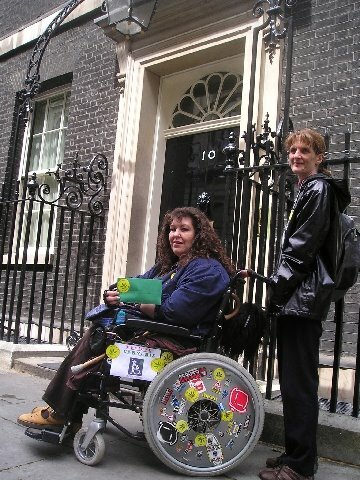 Above: Anita Curzon who suffers from Fibro Myalgia outside 10 Downing Street to deliver a petition to Tony Blair calling for action on medical cannabis. At the meeting in Parliament afterwards she said: "After using pharmaceutical drugs and having the horrific side effects that come along with them, it actually makes me very, very angry that I have to be made a criminal for using what is a natural based drug, which does not have nearly the side effects that pharmaceutical drugs have." Above: The event was organised by the Cannabis Education Trust because of 'intermiable' delays and 'foot dragging' by the government despite election promices. At meeting in Parliament Lord Rhy, who was closely involved in writing the ground breaking 'House of Lords Report on Medical Cannabis'. He said that the government had been "sitting on it for a very long time. It is taking an intermiable time for the license to be given to Sativex, which is the best product on the market at the moment. There is a very deep counter campaign going on (against medical cannabis). We want to know who is it that is influencing the decision making that is holding this thing up." 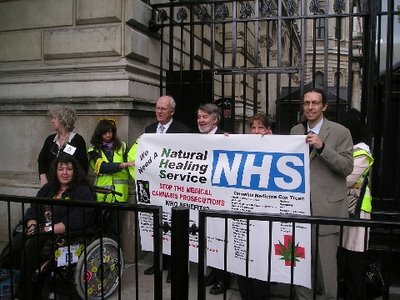 Above and below: We need the NHS - the Natural Healing Service. 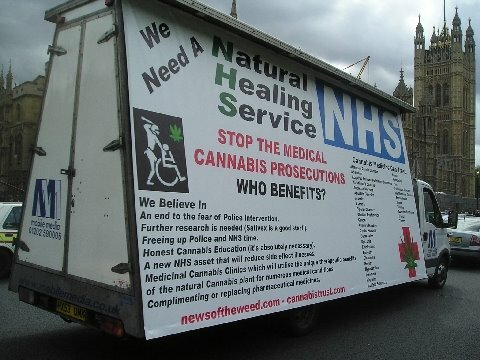 Today campaigners will be going to Downing Street and Parliament Square to call for medical cannabis to be supplied free by the NHS to treat pain, MS and many other ailments. They also want specialist 'cannabis clinics' run by experts to be set up, and the end to all prosecutions for the private use of medical cannabis. Campaigners say these policies could save the NHS millions, if not billions of tax payers cash which currently goes into the pockets of big pharmaceutical 'drug dealers' for drugs that often do not work as well as cannabis. To raise awareness of the issues and injustices that face medical cannabis users, would-be users, growers and those who supply sick and disabled people. 1. Who benefits from the prosecution of medical cannabis users? 2. Who benefits from medicinal cannabis prohibition? • The fact that Sativex (mouth spray) is still virtually unobtainable for UK patients. • The relative real costs of each form of medicinal cannabis, and the potential savings to the National Health Service budget if 'herbal' medical cannabis was allowed, as well as the more expensive pharmaceutical preperations. • The effectiveness of natural 'organic' cannabis tinctures, and hemp-based creams, along with vaporised, smoked or ingested herbal cannabis. What is really in the best public interest? 1. Recognition of the unique medicinal benefits of the cannabis plant in pharmaceutical and 'organic' herbal preperations. 2. 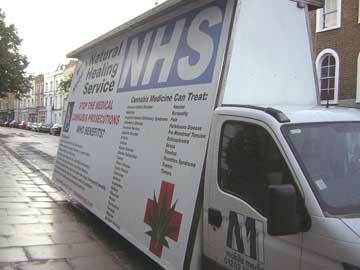 The establishment of medical 'cannabis clinics' run by experts. 3. An end to the prosecution of medical cannabis users, growers and those who supply sick and disabled people in the UK. 4. Further and broader medicinal cannabis research. 5. The establishment of a Committee of those with expertise in this field to examine the above issues with urgency. 6. A programme of honest education about the real issues surrounding medical cannabis. 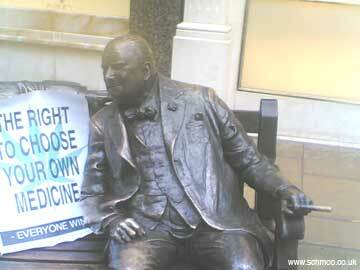 medical cannabis: winston churchill used it, why can't everyone else? Above: Winston Churchill in London yesterday. Tomorrow campaigners will be going to No 10 Downing Street to take to deliver a letter asking his predecessor Tony Blair to pull his finger out and make medical cannabis available on the national health, like he promised he would if the research was positive - and it is! cannabis: queen victoria's healer, why not everyone elses? 'Medical Cannabis Awareness Day' is tomorrow (24 May) in London @ Parliament Square: time table. 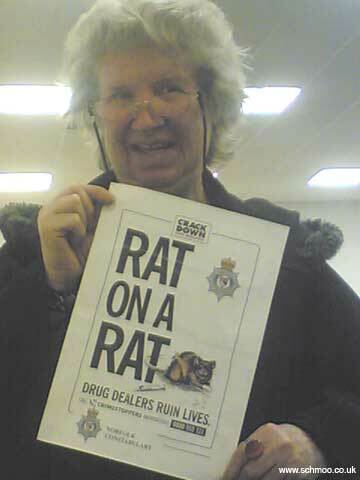 Above: Cannabis Grandma, Pat Tabram says the biggest dangerous drug dealers in Britain are the pharmaceutical companies. She says they are the real rats. She will be leading a delegation of medical cannabis users and experts to No 10 Downing Street on Weds 24th May, to give Tony Blair a good ticking off. He still has not kept his promises on medical cannabis. There will also be a 'Medical Cannabis Awareness Day' demonstration all day in Parliament Sq, and a lobby of MP's. One of the groups supporting the Medical Cannabis Day of Action are THC4MS who have been making and supplying medical cannabis chocolate to MS suffers for years but now face prosecution. If you have not already done it: sign their petition. Heather Mills, Paul McCartney's ex, demanded that he quit smoking cannabis before she would marry him. She said choose between me or the spliffs. What Heather did not mention of course is that Linda McCartney who died of cancer, benefited greatly from using the drug medically to off set the effects of chemo therapy. Scientists at Londons Imperial College have just announced research that shows cannabis gives effective pain relief after major surgery, such as knee operations, "with minimal side effects, at low doses." Dr Anita Holdcroft, from Imperial College, the lead researcher said: "Pain after surgery continues to be a problem because many of the commonly used drugs are either ineffective or have too many side effects. These results show that cannabinoids are effective, and may lead to the development of a wider range of drugs to manage postoperative pain." Previous research has shown that cannabinoids help top up the bodys natural system for reducing pain sensation. The researchers used a cannabis extract called 'Cannador' which is taken orally. 'Cannador' was developed by a non-profit group, the 'Institute for Clinical Research' in Berlin, Germany. Thousands of people in Britain who could benefit from the cannabis based drug 'Sativex' made by GW Pharmaceuticals can't get it, and campaigners believe this could be because of a widely reported but flawed inquest held in Sheffield last year. The inquest ruled that Sativex played "a significant role" in the death of Mrs Anderson, a 69 year old diabetic - but failed to consider the fact that Sativex contains a significant amount of alcohol. Diabetics are very sensitive to alcohol - it can kill them! During the inquest it emerged that Mrs Anderson, who took Sativex every day for several weeks, was probally given too much, and her dose was reduced after she complained of side effects. In his ruling the coroner, Chris Dorries said: "On the balance of probabilities, I find that the initial drug reaction (cannabis) must have been a significant contributory factor in at least the initiation of the illness which continued." But he failed to mention the other drug involved - alcohol. Unlike cannabis, alcohol kills thousands of people every year. The coroner recorded a 'narrative verdict', finding that Mrs Anderson died from kidney failure due to Adult Respiratory Distress Syndrome "following resolving pneumonia due to immobility arising from toxic brain syndrome". News of the Weed adds: Sativex is a very useful cannabis preperation and should be made available now, but if Mrs Anderson had been given the correct dose of a non alcoholic version of Sativex as used by the Cannabis Grandma, or THC4MS (cannabis chocolate) she would have been ok.
• GP Pharmasecticals published the Preliminary Results from their 'Sativex® Phase III Multiple Sclerosis spasticity study' in March this year. Every study they have done looks good - but the government is still dragging it's feet. Meanwhile thousands of people suffer. 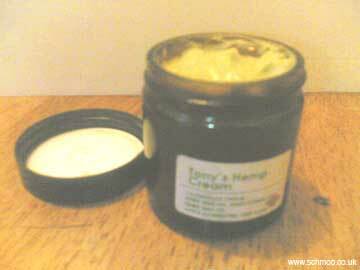 Above: This jar of 'Hemp Cream' could help win the World Cup for Britain - except for the crazy rules that out law the use of medical cannabis. Doctors are doing everything they can to speed up the healing process for brilliant goal scoring British football star Wayne Rooney who may not be able to play in the World Cup because of a broken foot. They are making Wayne Rooney sleep in an oxygen tent, they may be using lazers on him, and if they had access to alien technology they would use it - but they won't use medical cannabis. Britain's chance to win the world cup could be lost because of a crazy law. If Rooney was to use the cannabis cream he could heal quicker - but fail a drugs test and be out of the world cup anyway. Meanwhile thousands of people are 'out of life' because of the ban on medical cannabis. It can help MS sufferers stay out of wheel chairs, and help recovery from anti cancer treatments, and off set the side effects of drug treatments for AID's. The only people who benefit from the ban on medical cannabis are the drug companies selling products that do not work as well. That is why there is a worldwide campaign to legalise medical cannabis - and why representatives of the campaign in Britain, and medical cannabis users will be meeting MP's on the 24th May to demand urgent action. Vernon Coaker the new drugs minister really is called Vernon Coaker! And, before anyone asks, he has admitted not taking coke, er ... but claims he was a toker. In a frank interview with the Coventry Evening Telegraph he said "I took one or two puffs of marijuana but that was it. I think it was once or twice." Mr Coaker told the newspaper he had not enjoyed the experience and decided not to do it again. He added, perhaps suffering from long term memory loss: "I think it was at a party or something." News of the Weed says: "Mr Coaker must be already sick of cocaine jokes, so we will just say 'welcome dude, chill out and enjoy the vibe, no need to be paranoid". On a tour to see how 10 cities and towns tackle drug abuse, the new New Labour Drugs Minister said: "I'll be asking: 'If you have one wish, one demand you think could be done, what would that be?'" 'News of the Weed' is happy to make a suggestion: "Here is an easy one, there are no excuses, it really could be done: legalise Medical Cannabis NOW; it is even good for getting off coke". "MPs from all parties have admitted prior cannabis use, but are there any prepared to admit current cannabis use, even for medical reasons? Hypocrisy has always prevented an honest drugs debate." 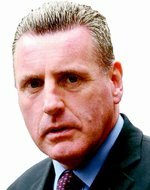 * Vernon Coaker and all the posse are invited to the 'Medical Cannabis Action Meeting', Committee Room 18, Palace of Westminster, London, May 24th. News of the Weed says: Be there, or be a croaker. Medical Cannabis Day of Action, London, Weds May 24th, 10 am - 5 pm. 10 am - Medical Cannabis Demo starts Parliament Sq, plus lobbying of MP's. 1 pm - Delegation to Downing St.
3pm - 4pm - Press Conference & group lobby of MP's in the 'House of Parliament', Palace of Westminster, Committeee Room 18. 4 - 5pm - Demo continues Parliament Sq, plus there will be a further chance to lobby MPs in lobby area, photo opportunities etc. Organised by members of the Cannabis Education Trust which is calling for the government to give GW Pharmaceuticals the go ahead now to distribute Sativex in Britain, for the establishment of 'Medical Cannabis Clinics', and for the end of prosecutions of people using and growing cannabis for medical purposes. 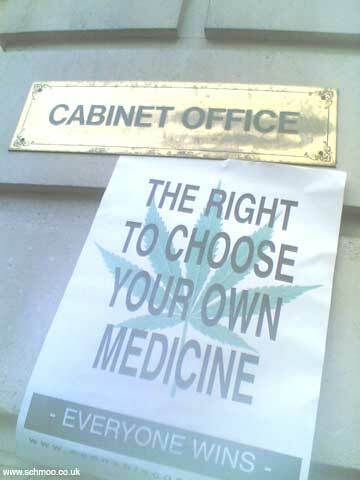 Above: The right to choose your own medicine. 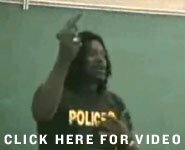 DEA Agent Lee Paige, 45, loved to lecture on the perils of drugs, but in front of a class room of Florida school kids, it was he who ended up in peril - of himself. Paige produced a Glock .40 hand gun in front of the kids, told them he was the only one in the room professional enough to carry the weapon - and then shot him self in the foot. Once the target of dangerous drug dealers, Paige says he is now the "target of jokes, derision, ridicule, and disparaging comments" thanks to a video of the incident being put on the internet - by colleges in the DEA. Now he is suing the DEA because he has suffered "emotional pain and suffering, mental anguish, loss of the enjoyment of life, loss of reputation, loss of opportunity, loss of money, embarrassment, humiliation and anxiety." 'News of the Weed' says: maybe Paige should join the CIA - the 'Cannabis Inhalers Association'. DIFFUSION TENSOR IMAGING, a newly developed magnetic resonance imaging technique, enables researchers to gain a better understanding of the effects of cannabis on the brain. In a preliminary study published today in the open access journal Harm Reduction Journal, researchers used diffusion tensor imaging to compare the brain tissue of young people who had used cannabis moderately as teenagers, and young people who had not. The researchers failed to find any indication that damage to the developing adolescent brain occurred. DeLisi and her colleagues found no significant differences in brain integrity and brain volume between cannabis smokers and non-smokers. Their preliminary study suggests that moderate cannabis use has no direct adverse effects on brain structure and integrity. The authors warn however, that more research is necessary, both in a larger group of people, and to see the effects of heavier use. Hopefully they will be given more cash for research. The Judge has indicated that the THC4MS x 3 will be taken for trial. Grandma Pat Tabram is also likely to be put on trial as a medical cannabis user. In North Wales, Jeff Ditchfield is facing charges of conspiracy and others. Previously, Chris Baldwin, Colin Davies have been sent to prison, and the late Biz Ivol and Tony Taylor and others have been taken to court - there are MANY others who have been prosecuted for medical cannabis cultivation or possession. Quite clearly - and remembering that the law says still that cannabis has no medicinal value - this is an ATTACK on medical users and suppliers. In the US, Cheech was locked up for running an on-line paraphenalia shop; in the UK several shops selling growing equipment have been told not to sell seeds. This is an attack on cannabis users. 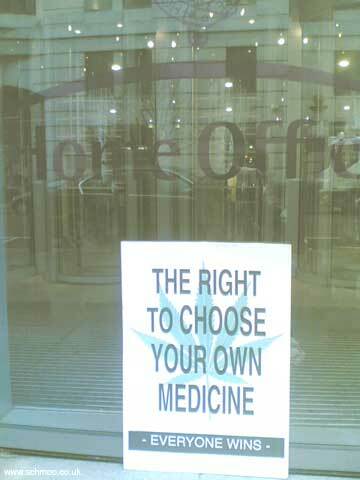 Meanwhile, with respect to the campaigners and organisers, 2006 promises already two forms of protect: one in the cause of cannabis medicine, the other in the name of hemp. 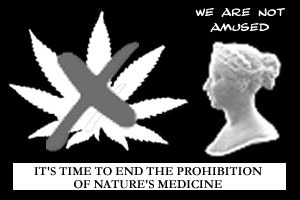 Prohibitionists have for some time accused the medical cannabis movement, as well as the pro-hemp movements of being in reality, legalisers. Now it's like the reverse is happening: the legalisers are becoming the medical activists and hemp activists! Whilst the prohibitionists accused those of trying to legalise cannabis by the back doors (false in the past, maybe), legalisers are now saying to me that medical and industrial cannabis based campaigns meet with less public and authority resistance. Make no mistake: the UK and US Governments are "at war" with cannabis users: sure, the law may have changed to allow police to focus on crack cocaine etc, but wherever that problem of hard drugs is solved (in small communities at least), police turn their attention on cannabis growers and users! It's just that they seldom get mentioned in the press. The question is are we all now prepared to STAND together side by side against this prohibition? Derek Williams, Pat Cadman ... not one. The Court is not going to legalise cannabis for us - they are about law, rules, games, debates, NOT justice There's more "heart" in mathematics! If some of those judges and barristers were told to take THC4MS x 3 out and shoot them, believe me, they would (maybe also out of fear). The Politicians are not going to legalise cannabis for us as they have no reason to. The People are not going to do it - even 5 to 10 million users - mostly too afraid to act. The media will not do it. the dealers will not do it. Neither will the church. The ONLY people who will bring on legalisation is the campaigners. Let FEAR defeat us now and we have LOST. Stand arm in arm and we can win. A "conspiracy of three" is an easy target. Of 40 a little more difficult. Of hundreds even more difficult. 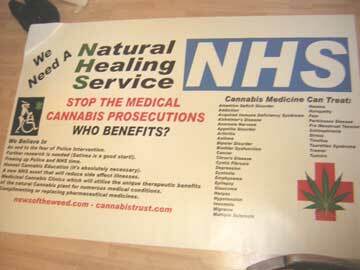 WE NEED to stand side by side in Court - to demand that we are charged too with conspiracy however small our involvement (simply telling people about the work and media who have given THC4MS free adverts, universities, doctors, patients, organisers of fairs giving free space, leaflet distributors, donors - all guilty! SO I AM ASKING NOW ..
1. joins us in our "Confessions" in the ACTION forum at http://www.lca-uk.org/lcaforum. This is where 46 people so far have already shown solidarity can be seen. Divided we may fall. Together we can move a mountain. 'Counter Punch' reports that the US American Food and Drug Administration chose the 20 of April (4.20) to issue a total lie: the assertion that "no scientific studies" supported the medical use of marijuana. "The statement was not the work of a panel of experts reviewing recent research. It was issued, supposedly, in response to numerous Congressional inquiries, but actually at the behest of the DEA and the Drug Czar's Office. Its release on 4/20, a day of special significance to marijuana users, shows the juvenility of its authors, who apparently regard Prohibition as a little game they're playing with the American people". However the American people may be waking up to the fact they may be the most lied to and ripped off people in the world. "never met a scientist who would say that marijuana is either dangerous or useless." • More at the excellent 'Counter Punch' which publishes an extensive feature, by Fred Gardner editor of 'O'Shaughnessy's' the Journal of the California Cannabis Research Medical Group. He traces what happened after a study into the effects of marijuana use by pregnant mothers found no harmful effects: the study was buried, and funding for a follow up study was refused. News of the Weed says: Seems the US government pays more attention to the Witch Doctors at the Drug Czars office, than to real scientists. Meanwhile Republican and Democratic senators have called for drug czar John Walters to be fired because of his focus on marijuana instead of methamphetamine, which really is a killer. Above: Opps... schmoo sparked off a minor security alert taking this picture in the rain outside The Cabinet Office in Whitehall today. The 'Anti Terrorist Squad' were very nice, once they realised we were not part of the radical 'Bring Back Charles Clarke Campaign', and were in fact supporting Medical Cannabis as part of the 'Global Cannabis Action Day'. We were shocked how rusty the Cabinet Office sign has been allowed to get. Today is the begining of 'global cannabis action' month and there are events in 200 cities world wide. schmoo says: I have given up using cannabis, but I still support the end of cannabis prohibition worldwide and in Britain - for health reasons. The government says cannabis prohibition should continue because it is a dangerous drug, and the law should protect people's health. Certainly for some people cannabis does have it's dangers, and they should not use it. But prohibition is much more dangerous than cannabis, as we know from the days of Al Capone. That is why cannabis should be legalised now - to protect people's health. Above: Medical cannabis campaigners visited the the 'Home Office' in London today as part of the Global Cannabis Action, but there was no one in, as sadly the previous occupier, Charles Clarke, has been evicted. 'News of the Weed' says: Charles Clarke was one of the best Home Secreteries ever. This is not a difficult accomplishment, after people like Michael Howard, but we will miss him. • As part of the Global Action there will be a MEDICAL CANNABIS DEMONSTRATION, @ PARLIAMENT SQUARE & 10 DOWNING STREET, WEDS MAY 24th 2006 (10am-5pm). 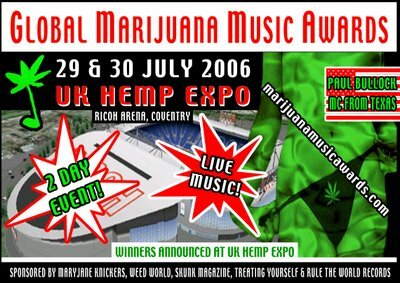 There may not be a cannabis festival this year, but the closest thing will be at the UK Hemp Expo 29 & 30 July at the Ricoh Arena, Coventry. 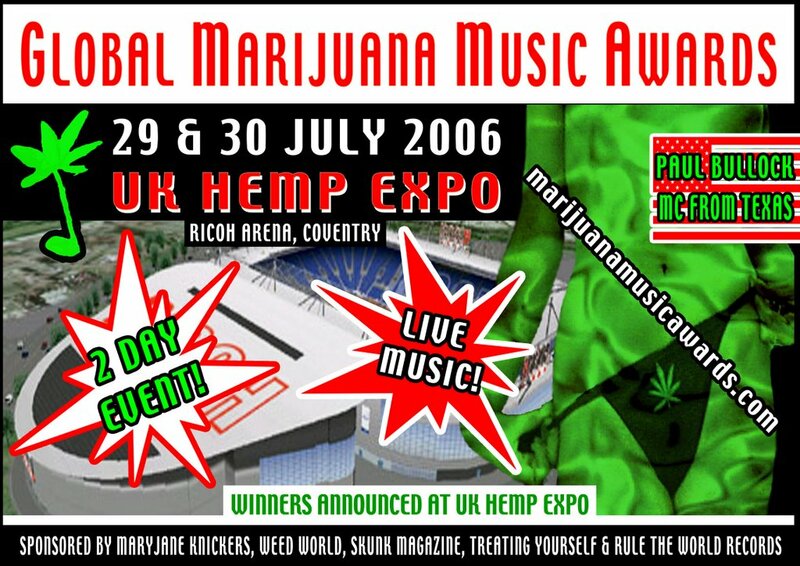 As part of the 'Global Marijuana Muic Awards'which will be happening at the Hemp Expo, there will be live performances from Los Guys, Jules Levy, Tony England & the Coffeeshop Band from the UK, Assi Rose from India and Ruffstar Family from Holland. Paul Bullock, Pot Poet from Texas will be MC, assisted by the Hot Pot Pixie also from the US. For more info check out marijuanamusicawards.com"
whopping 223 entries from 7 countries! Marijuana musicians entered from the US, UK, Australia, Holland, India, Austria & Germany. Music styles range from Punk Rock to Texas Country Music, from Chicago Gangster Rap to Calypso from India, all with one thing in common - they're all about Marijuana!